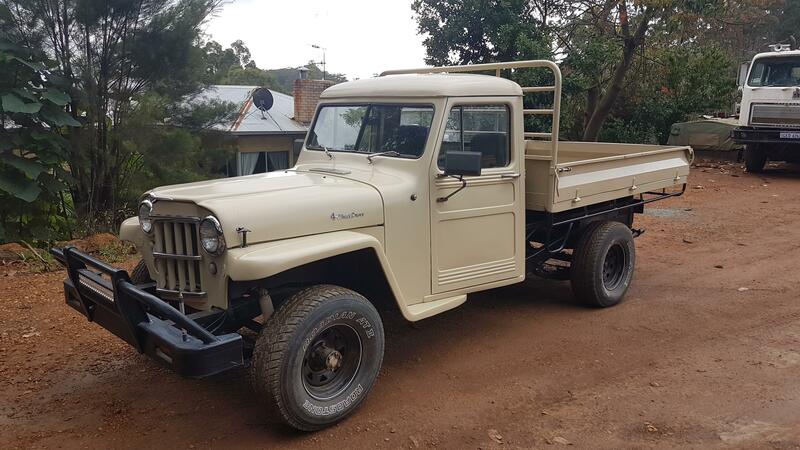 I picked up this 1966 Willys 4WD Pickup. 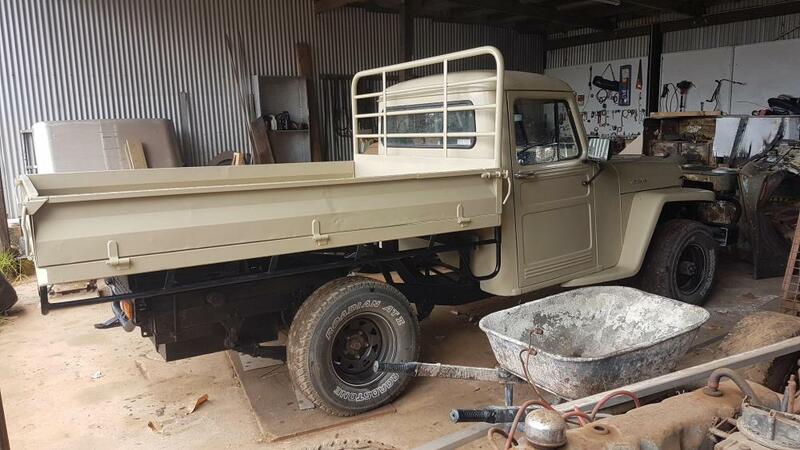 It has a good body and Toyota 3B diesel engine transplant. The truck has a mysterious 2-piece windshield, odd for that year. A closer look shows it was originally a one-piece, correct for 1966. 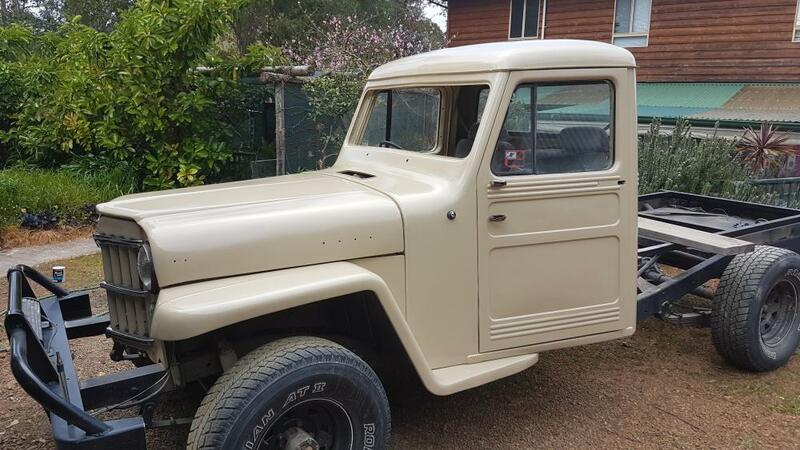 The last U.S. Willys Pickup was 1964, they still made them in Australia after that point. 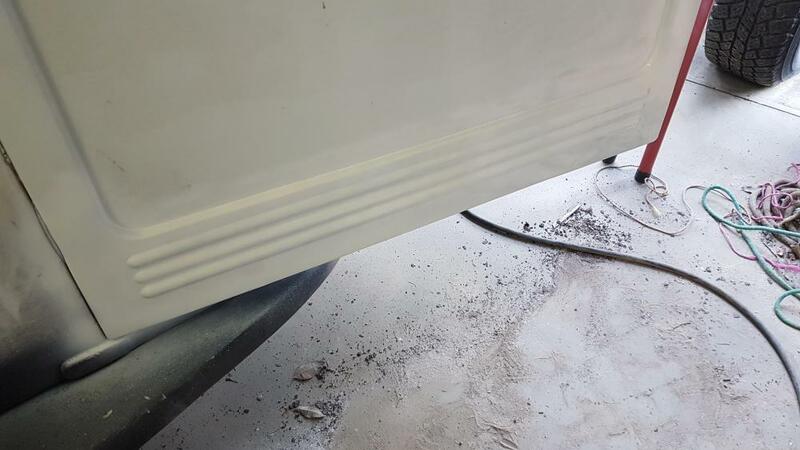 Nice bumpers. I will likely put a Toyota bed on this truck. 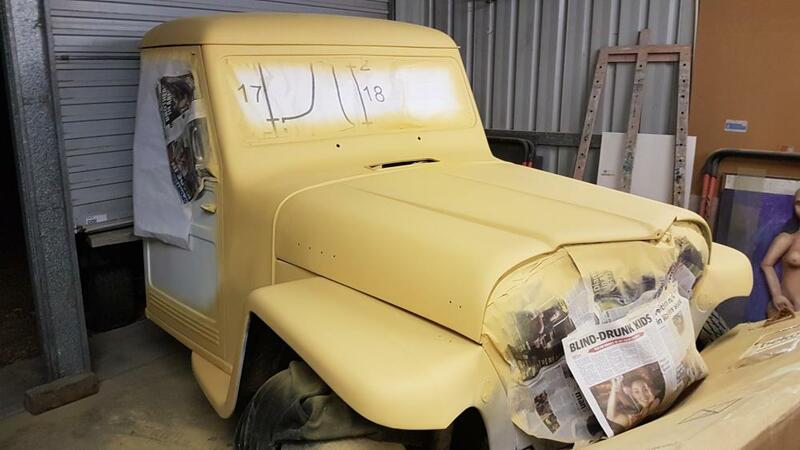 A better body than my 1957 Willys project. Will likely work on this one instead for now. Diesel engine is enough for this truck, drives well and get really good fuel mileage. 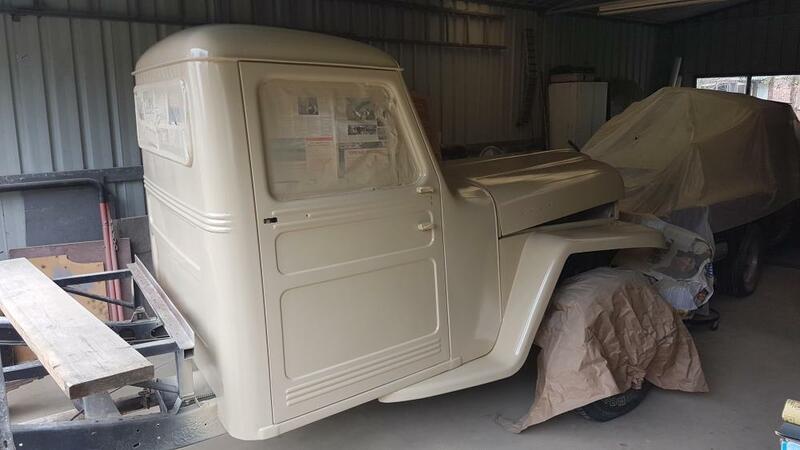 Right hand drive with signs of being built at Australia. 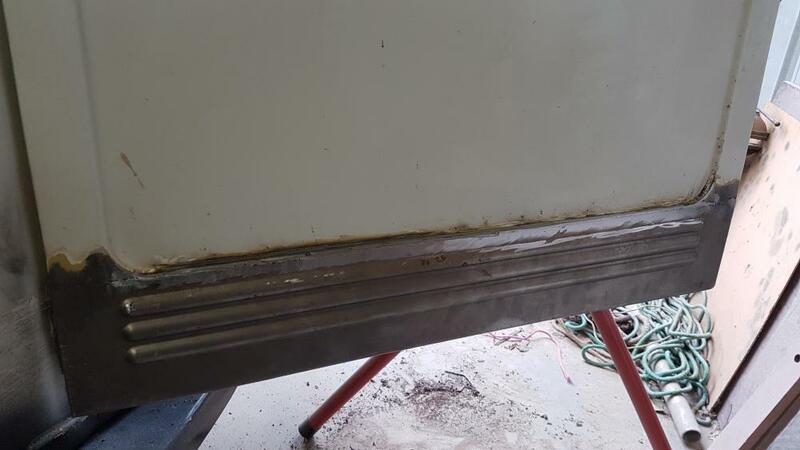 VIN says 1966 build. Below is a very interesting letter that describes how Willys made VIN numbers. This VIN code sheet is useful to older Willys-Jeep model identification. Here are the three VIN tags. 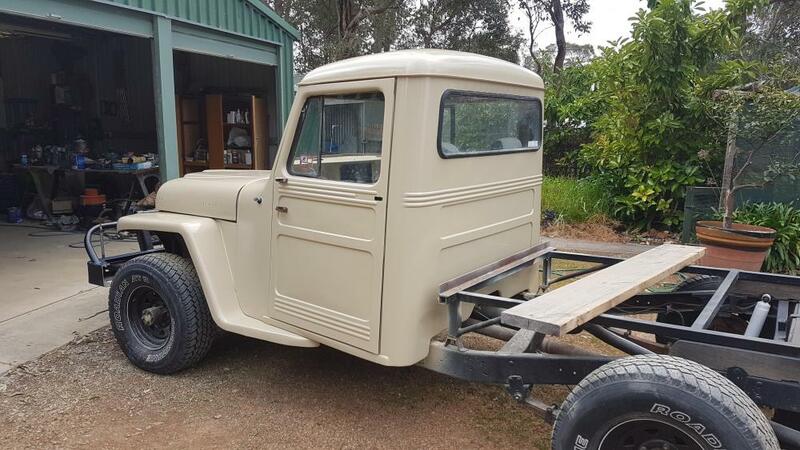 Interesting and indeed a rare Willys 4WD Pickup, Ian! 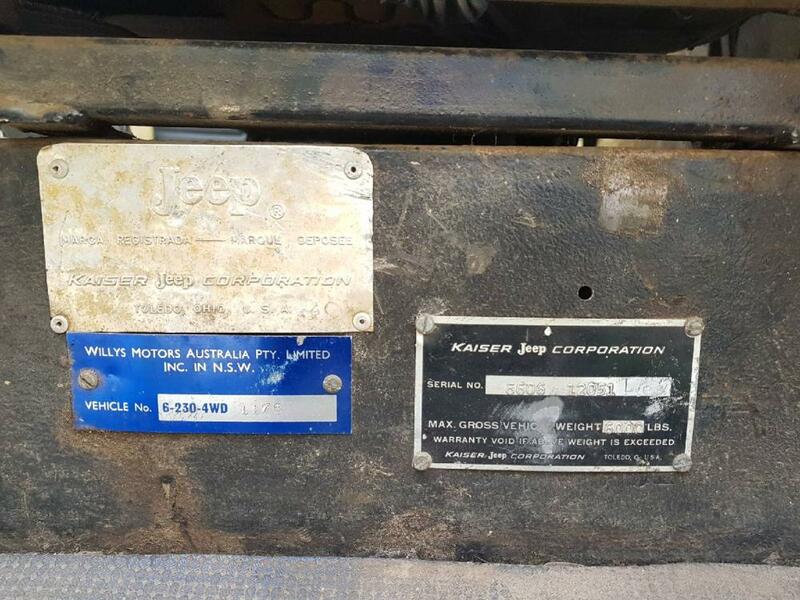 The Australia Pty Limited tag shows this was likely a 230 OHC Tornado inline six before the Toyota engine swap. 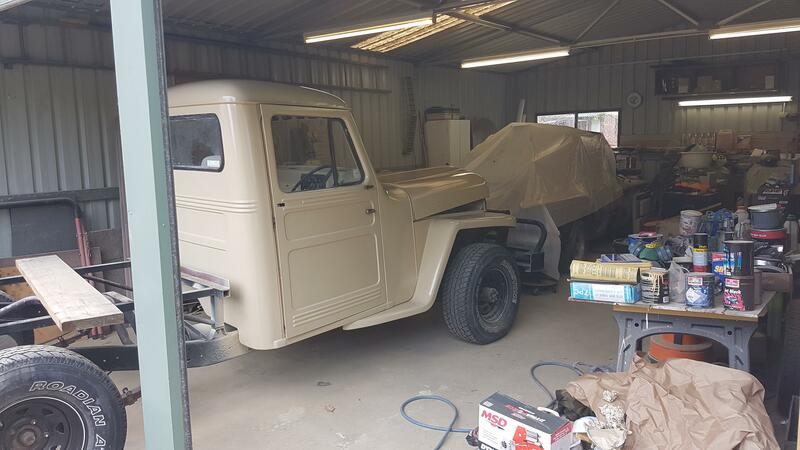 You are very fortunate not to have that engine in the Jeep, it was notorious for valve and valve guide problems, had a complicated valve timing mechanism and little could be said for its throwback 4-main bearing crankshaft. 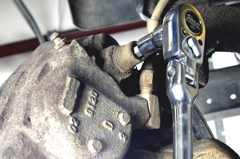 The 230 OHC engine was a pioneer engineering effort for a U.S. truck application in the 1962-65 era. The 230 Tornado evolved from Kaiser's Continental 226 inline six, a basically solid L-head. 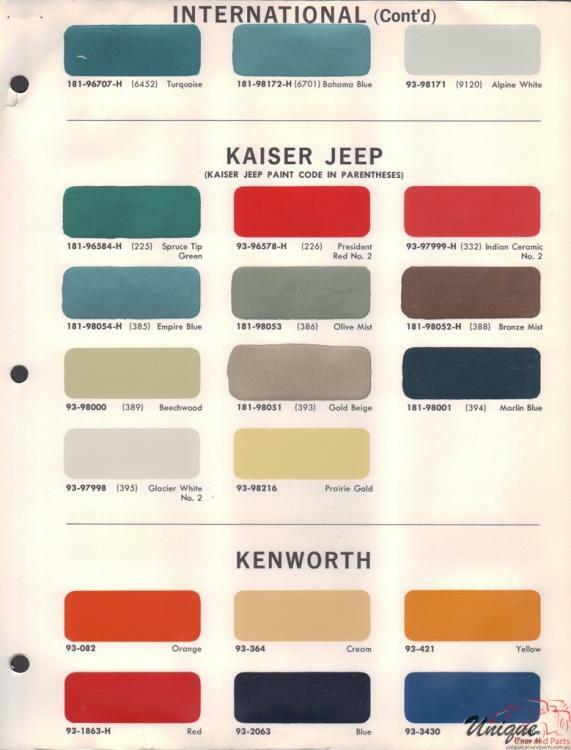 Kaiser-Jeep Corporation abandoned the 230 OHC design for civilian Jeep vehicles by 1965. 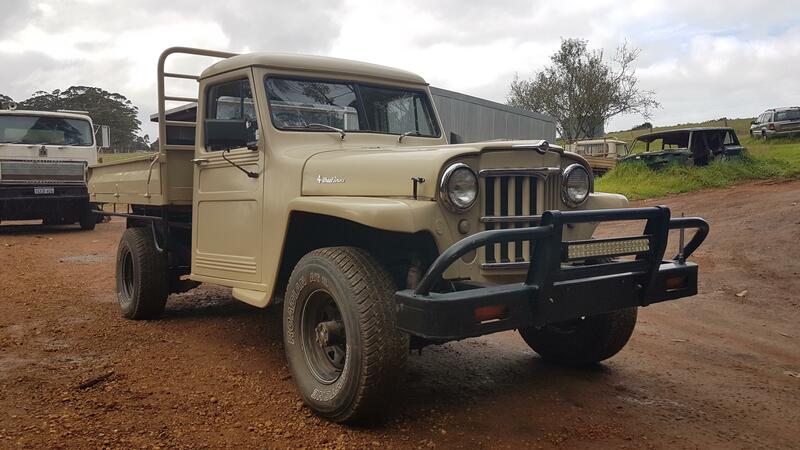 The base six-cylinder engine of choice in the J-truck and Wagoneer became the outsourced 232 AMC 7-main bearing inline six, a rugged design that survived and morphed into the 258 and later 4.0L engines. The 230 OHC survived through the Vietnam Era in the M-715 military trucks that were basically a Gladiator J-truck with mass. 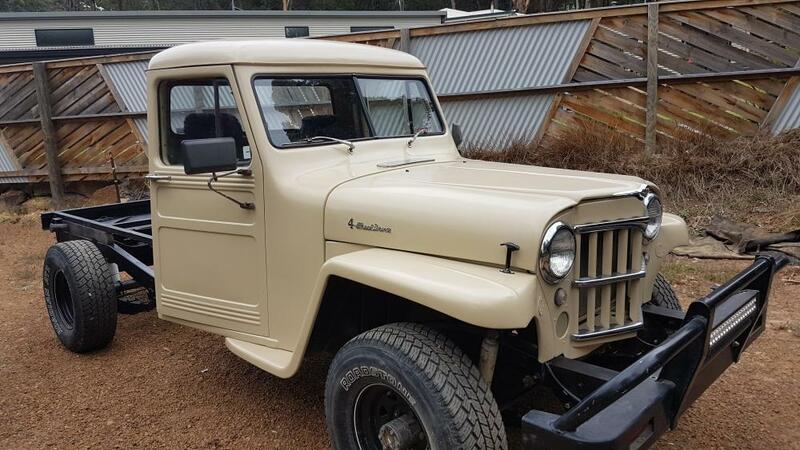 AMC's 327 V-8 also became a Jeep offering in the mid-'60s. Which, if any, of these AMC engines wound up in mid-'Sixties Australian-built Jeep models? 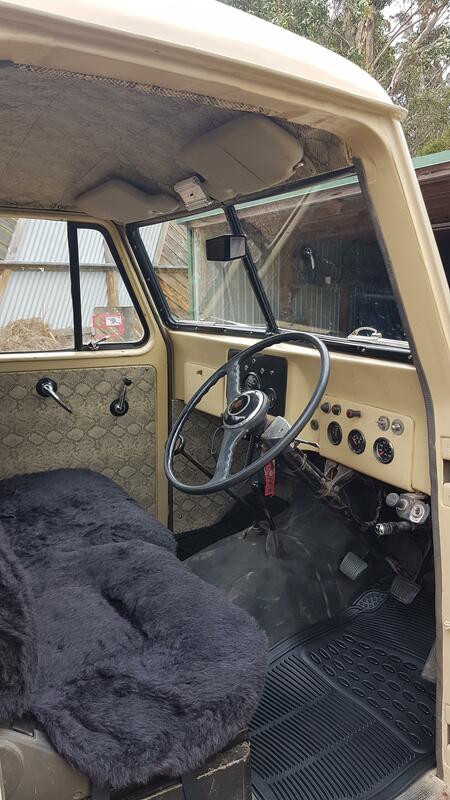 I see the trademark stock Willys steering wheel in your '66 cab. 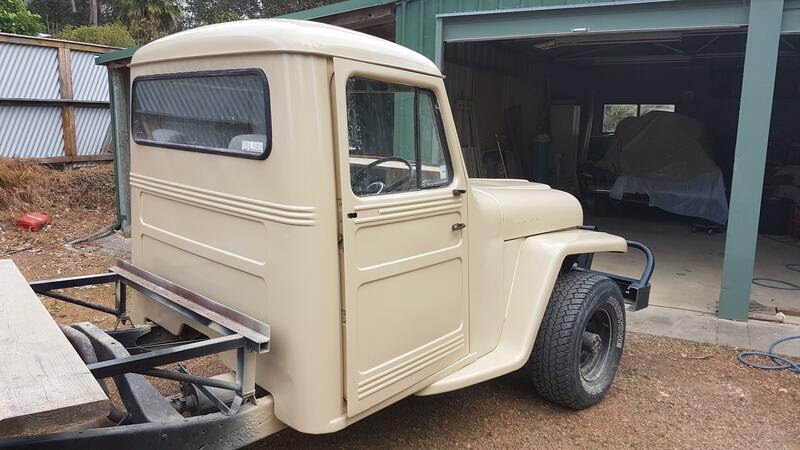 Does this '66 model Willys still have the Ross TL steering gear, or did they step up to something a bit better for Australia? 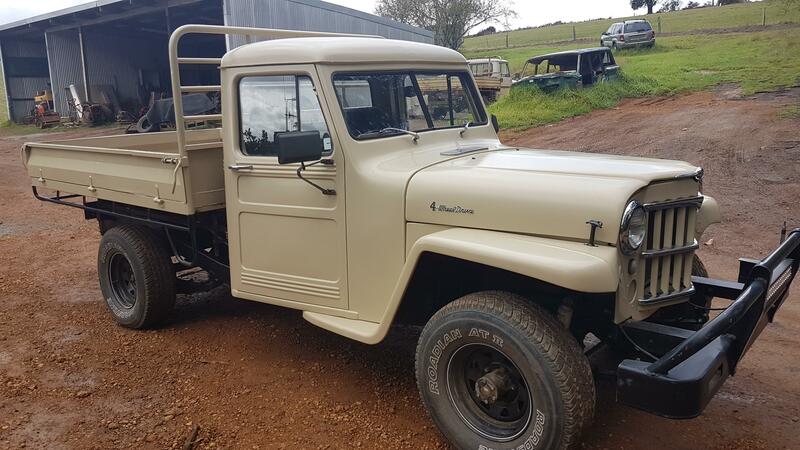 (U.S. J-trucks and the Wagoneer of that vintage were using Gemmer worm-and-roller gears like Ford and Dodge trucks did for many years.) However, your Willys steering column looks like it leads to a traditional Ross cam-and-lever steering gear...Would you keep the cam-and-lever TL gear? It's light duty for a truck this size and a diesel engine. How does the truck drive? 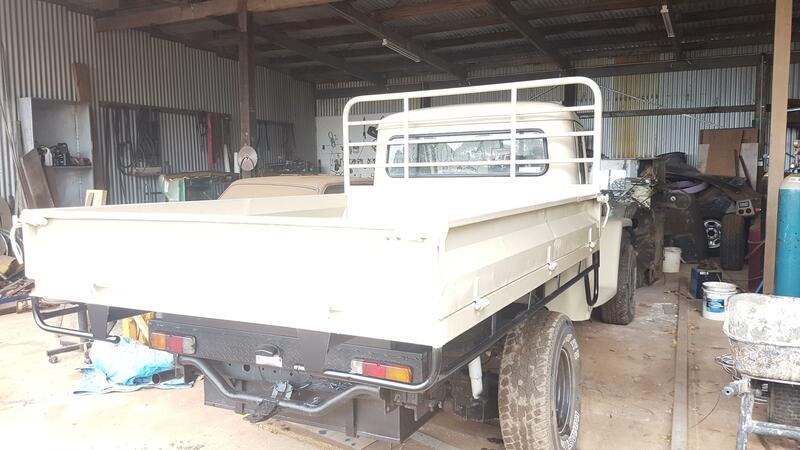 What does a 3B diesel engine weigh? 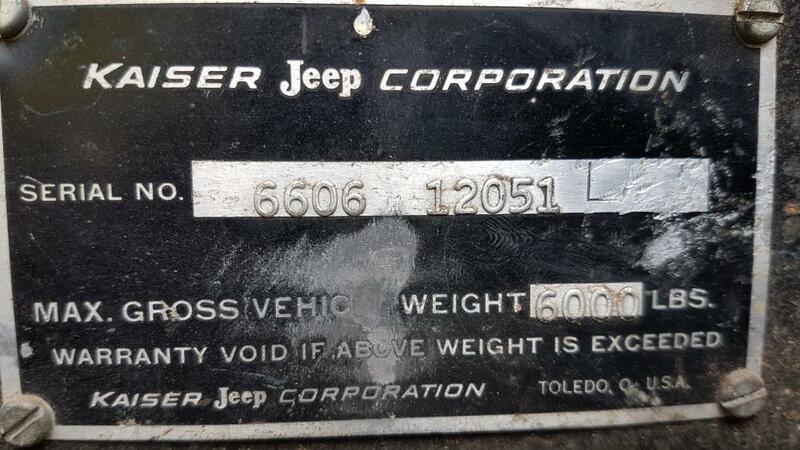 Jeep vehicles sold off the VIN plate and often the actual date of sale. 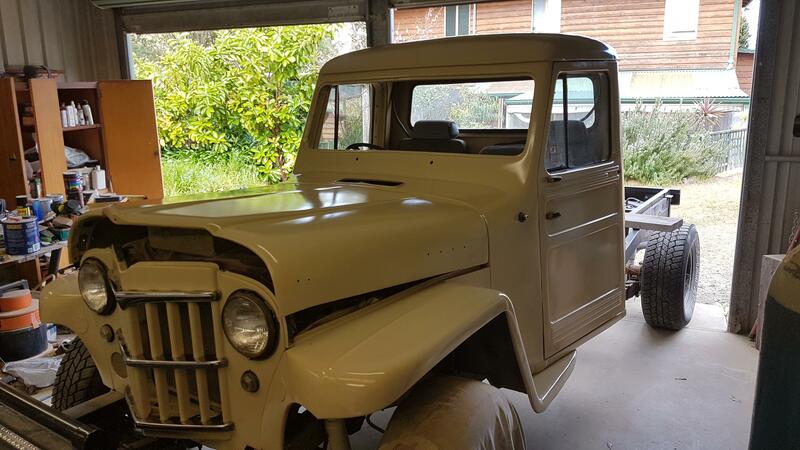 There were many early models that sold a year or two after production and were registered incorrectly, like a CJ2A being called a 1952 model on the title and registration even though the CJ2A had been replaced by the CJ3A several years before that date. 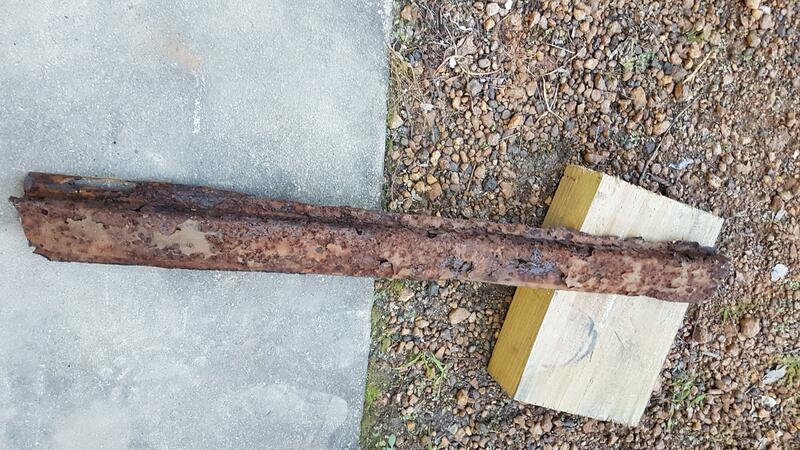 Some states even registered earlier vehicles from the engine number, which created a nightmare if a connecting rod tossed through a block and ruined the original engine—or when a block cracked seriously in a freezing winter. Most replacement engines came with no numbers stamped (either blank or milled off) to permit the owner to stamp the original engine/vehicle ID number onto the block. By the 'sixties, vehicles were sold by body VIN tag numbers only, which ultimately became stamped on the frame and other parts. its coming along nicely ive found a bit of motivation lately & the more progress i make the more keen im getting? 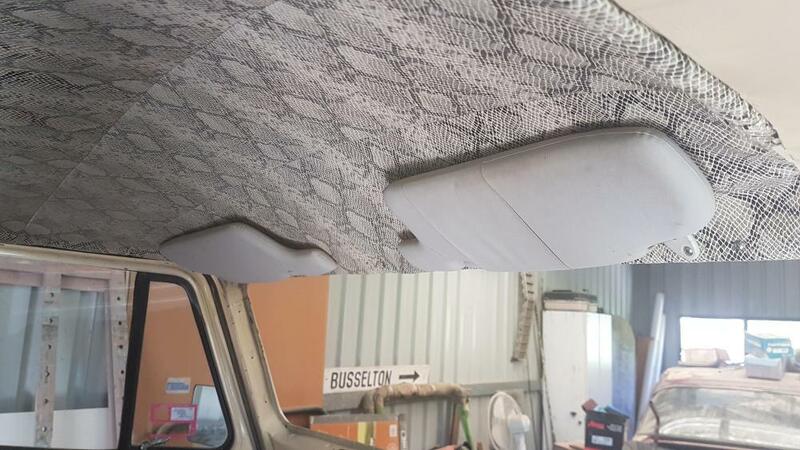 Where is the replacement panel manufactured? Or did you have a panel stamped? A project going in the right direction, Ian! 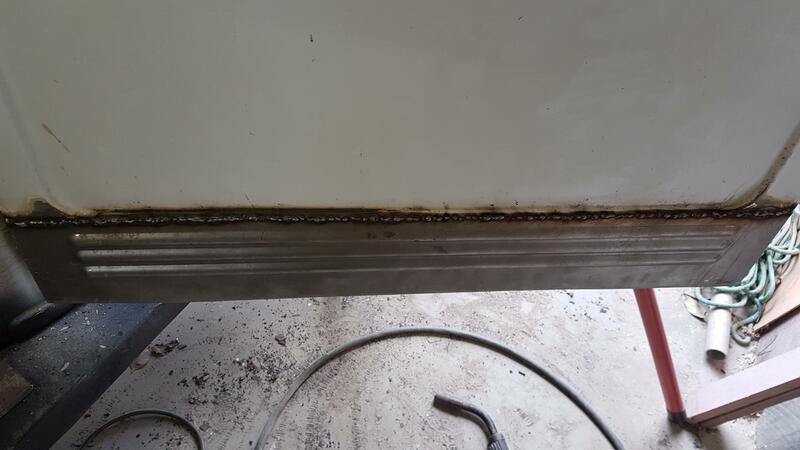 This is a quality, permanent repair of a rust prone area. 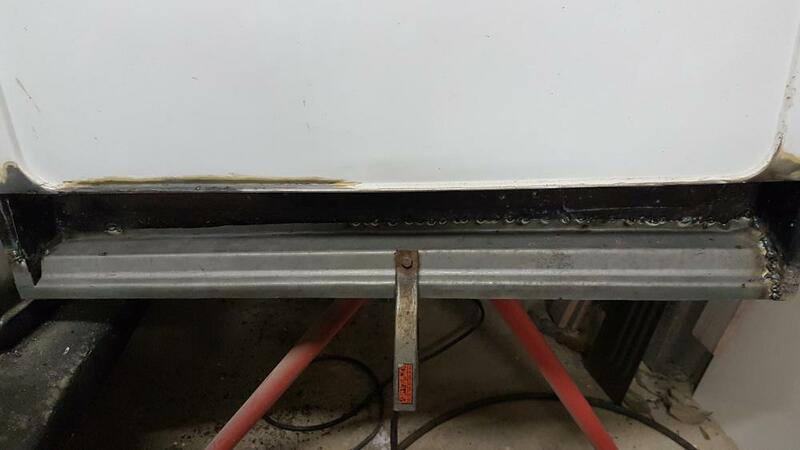 Good that the repair piece is available, obviously there's a demand for repairing these doors. 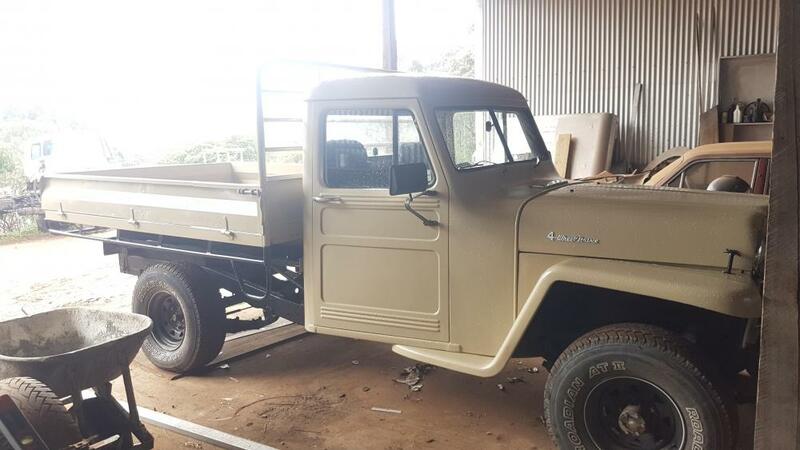 Ian...See if this helps, the factory workshop manual approach for the Willys-style Jeep pickups. Attached is a PDF with your information, see T-12 and T-13. 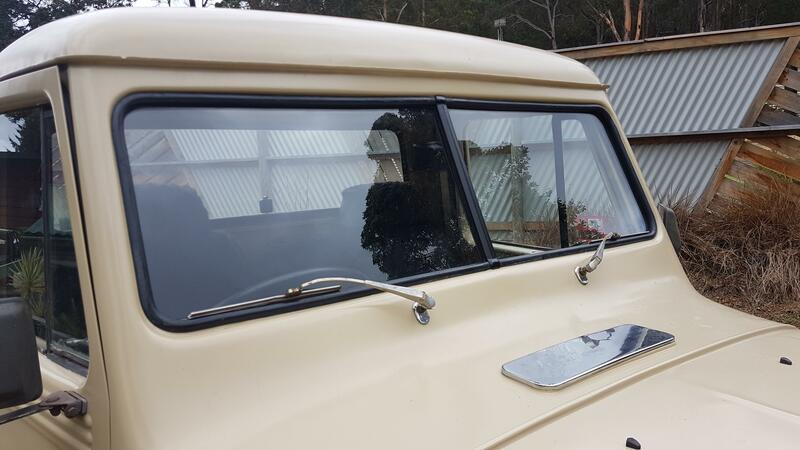 T-12 is the two-piece windshield glass installation, a two-person job for sure. P.S. : I recopied the document to make the 3rd page more clear. It's T-13 section but may have some useful tips. You'll likely benefit most from the T-12 (two-piece windshield) section. Sounds challenging, Ian...I guessed from the photos that this was a one-off installation but thought the OEM approach for the one- and two-piece windshields might cast some light. 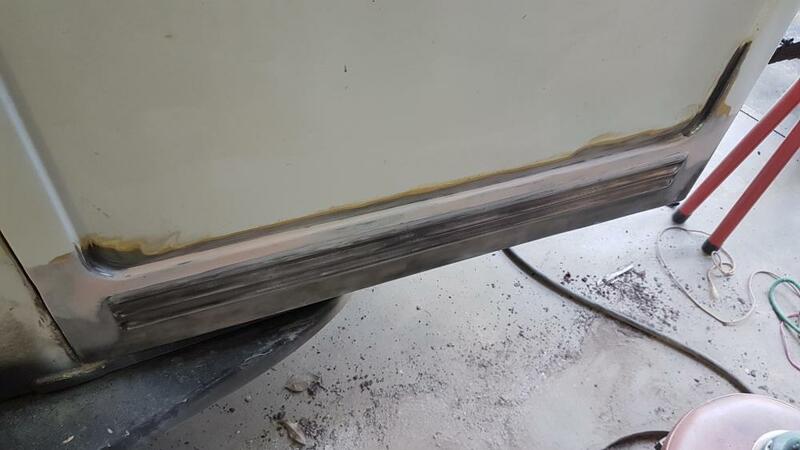 So, the glass needs custom sizing, fortunately this is flat glass, something "modern" vehicles don't have. I noticed the center rib. Is that a piece you constructed? 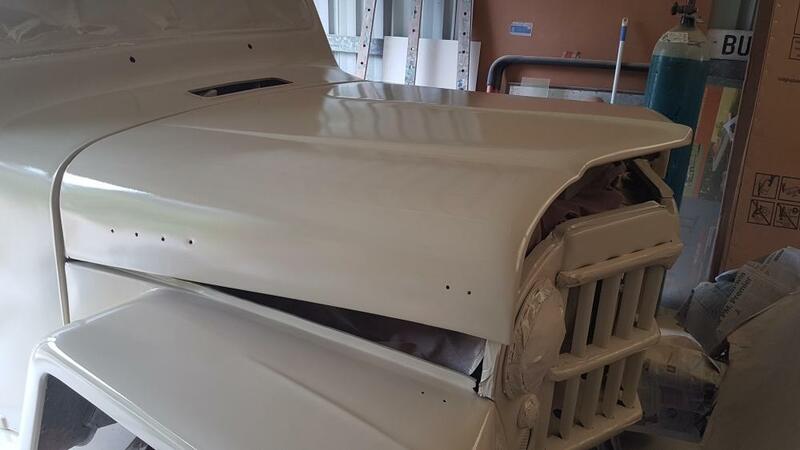 Will you cover this with a chrome trim piece? The video would be very helpful to others! Very cool pattern, Ian! Reminds me of Native American petroglyphs at our local Great Basin (USA). Australia has incredible Aboriginal artwork in the Outback and elsewhere dating back 40,000 years...Fitting theme for the Willys! The Willys/Kaiser plant at Australia was no different than the Willys plant at Toledo. Parts were mixed and used as available. 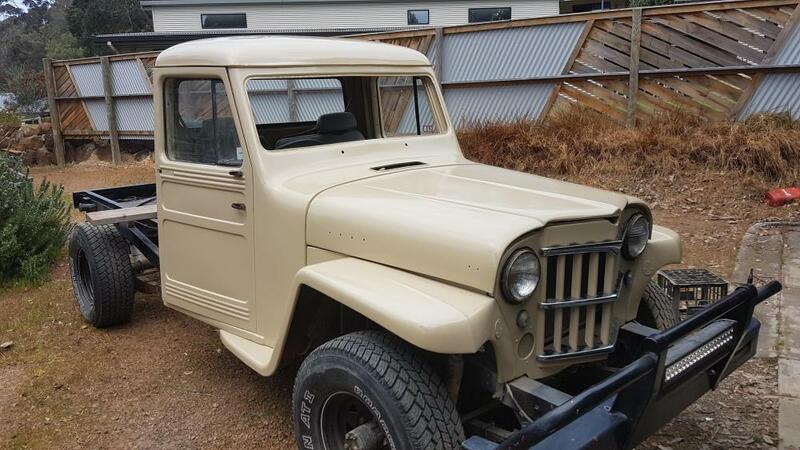 A classic example was the 1955-56 era CJ-5 and CJ-6. 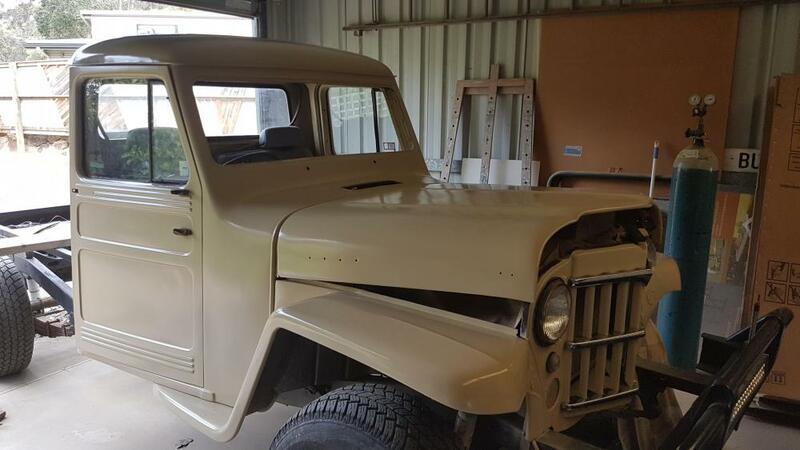 Willys used M38A1 frames, windshields and other parts in these models. 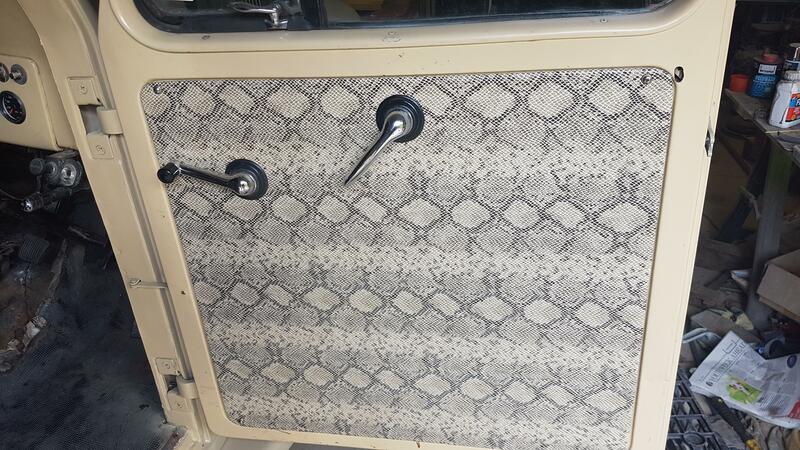 My '55 had "reversed shackles" at the front springs, the frame was M38A1 derivative. 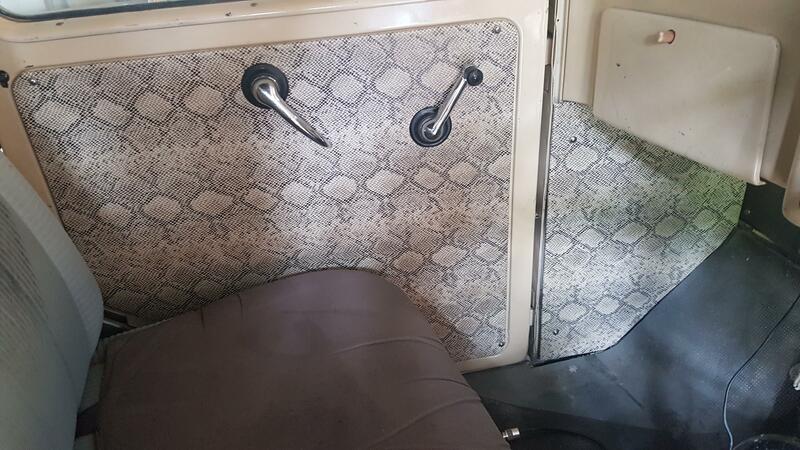 Actually a better design than the CJs with their front spring anchors at the rear of the leaf springs. Mine had a one-piece windshield, many had the two-piece design from the M38A1. Quite a project, you persevered! 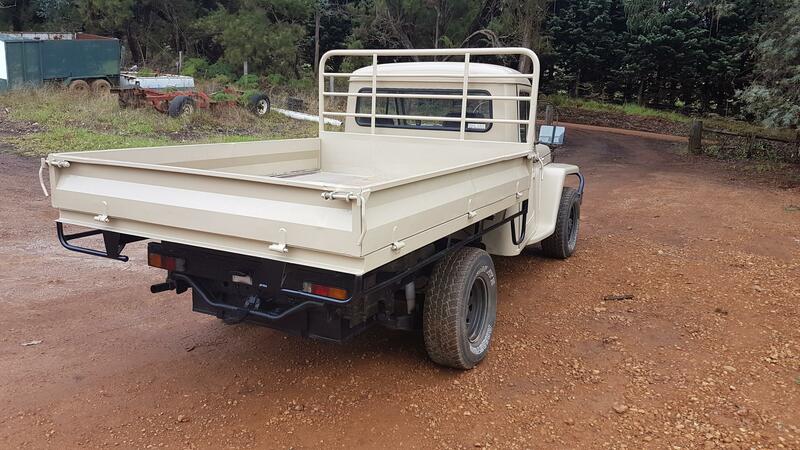 Nice work...The tray/flatbed deck at the back should do it...Is the powertrain ready for the long haul? 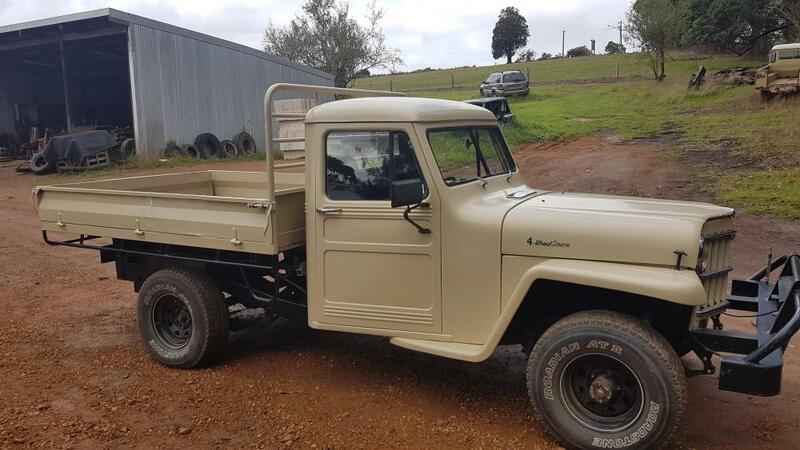 Ian...Great truck for a period look, function and reasonable modifications...What is the bed source? It has practical side-loading ability...Asian? 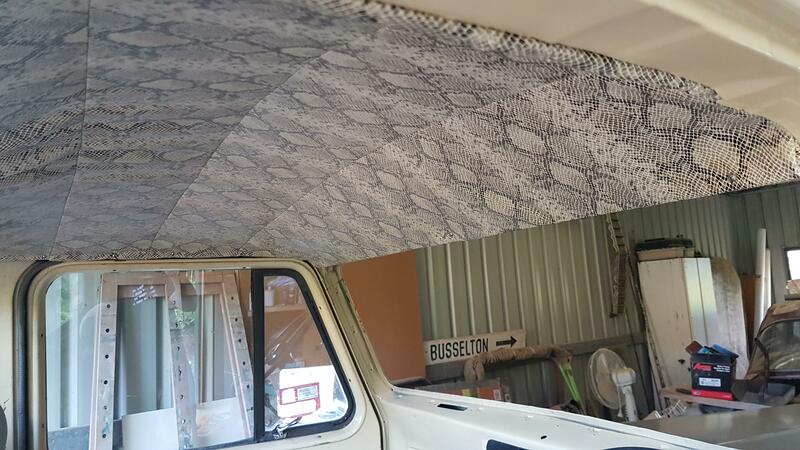 The head rack and front bumper should provide serious protection. 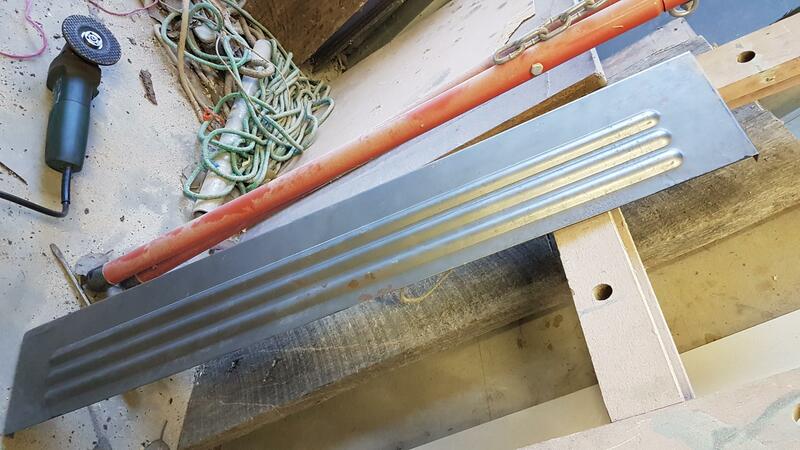 Do you plan to tuck a winch behind the front bumper? 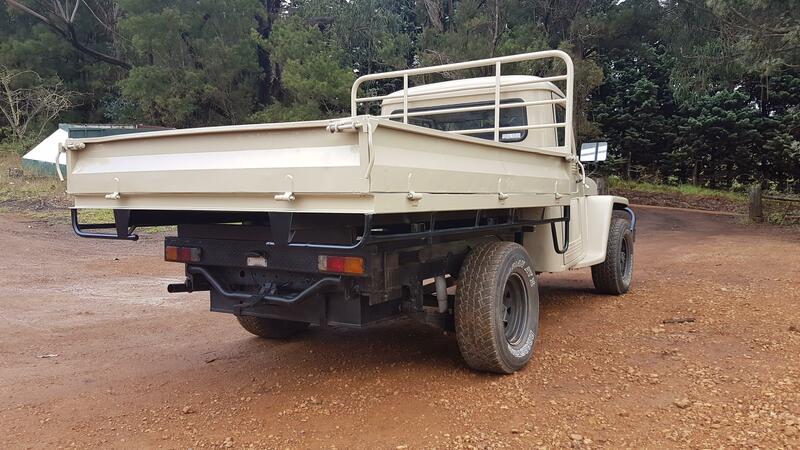 What is the curb (unloaded, on board fuel but no cab occupants) weight for the truck at this stage? Is the engineer with the vehicle registration agency? How does such a "referee" (California CARB engine swaps) interact with the agencies? Hi, Ian...The engineer sounds like the California model for Clean Air Resources Board. Engine swaps are legal if two basic criteria are met: 1) engine must be same year or new than chassis and in the same emissions class and 2) the tailpipe tests must show emissions at or below the emissions standard for the original engine in good operating condition. If the swap is legal, the owner takes the vehicle to a "Referee Station" for an inspection around the engine conversion. This stipulation made it impossible to install an Isuzu/GM 3.9L four-cylinder diesel engine into our gasoline XJ Cherokee. (Diesel engine to a gasoline vehicle was not the problem, the engine's use by GVW was the issue.) However, I could put a VW, Volvo passenger car or BMW turbo-diesel engine in this chassis. (Why bother, right?) 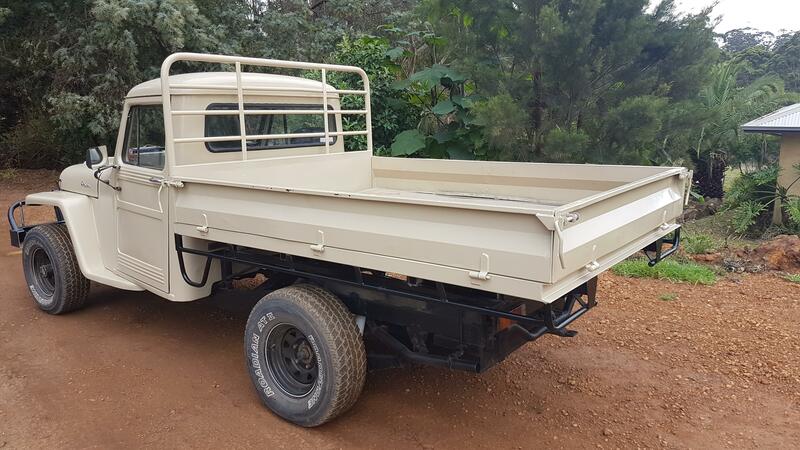 The requirements are very weird, as the Isuzu engine is relatively clean burning and emissions compliant, but the chassis applications are Emissions Class 2 and 3 trucks. I wanted a 50-State legal result. Advance Adapters was willing to prototype a swap kit, but we agreed that such a venture needed to yield a 50-State legal package. 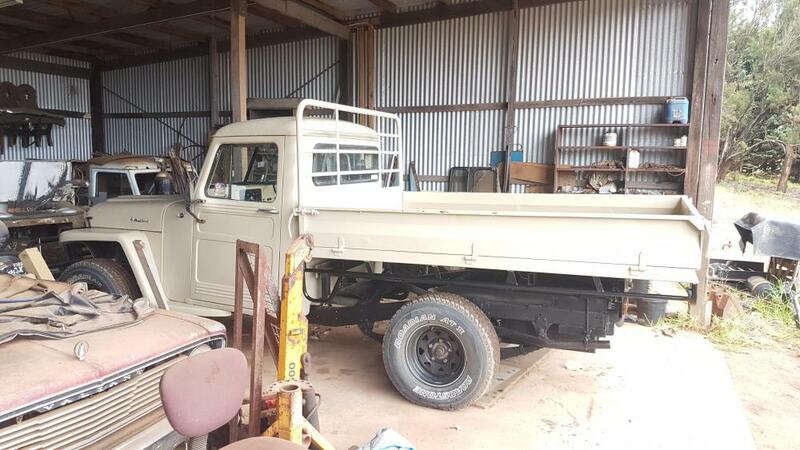 As a point of interest, Cummins is caught in a conundrum with its R2.8L turbo-diesel crate engine. The engine meets requirements for emissions but has no U.S./EPA approved use in a motor vehicle. (Cummins did a joint venture concept vehicle with Nissan. They installed this engine in a Frontier pickup with great results, but the model never went into production, which would have resulted in EPA approval and a legal emissions prototype for certifying the crate engine as a "2019 Nissan Frontier" (Class 1 emissions) engine...Cummins has been trying to certify this crate engine on its own merits to market as a California/50-State legal crate engine package. The California ARB has yet to approve or issue an E.O. number on this engine. The process is in stalemate at present. I'm rooting for Cummins, too, Ian...I publicized the R2.8L turbo-diesel with enthusiasm, including interviews with Cummins' Steve Sanders. Cummins was confident of an E.O. number from California, as Chevrolet got one on the E-Rod crate V-8 engine (which likely had a domestic vehicle installation prototype with EPA approval). Cummins was actually breaking ground with the effort to approve a crate engine without an EPA vehicle donor. The R2.8L engine meets Euro current and go-forward emissions requirements, way in excess of U.S. standards for Cummins' E.O. 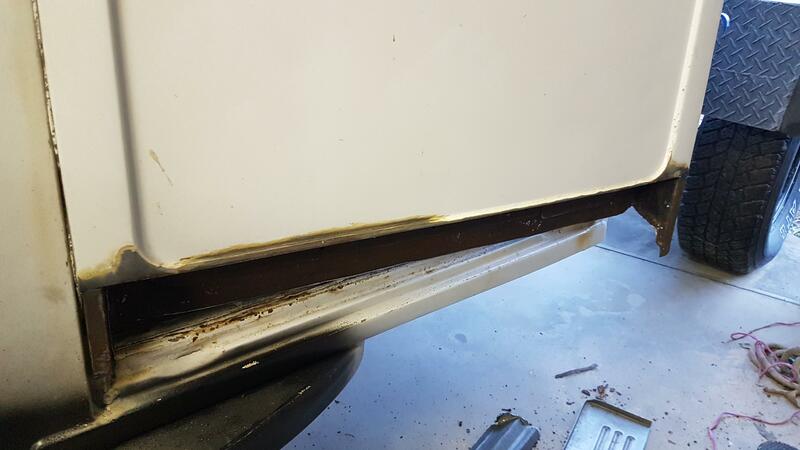 attempt, which initially targeted a 1999 or earlier chassis application—just to assure a lower bar for emissions levels. 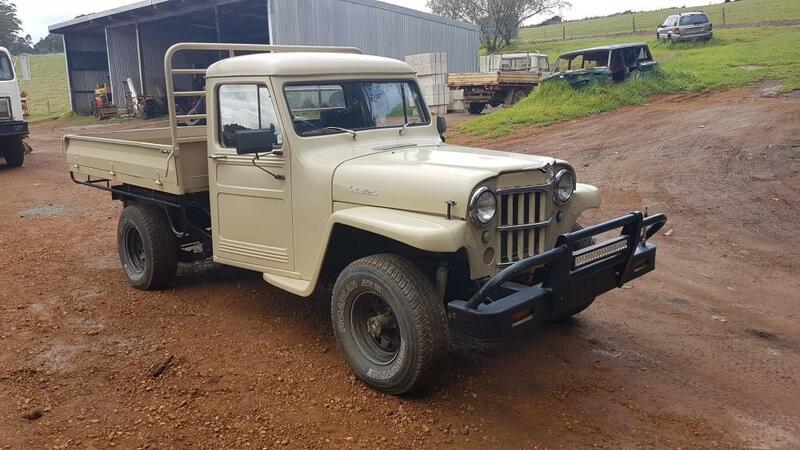 Cummins planned to proceed from there, gradually including later chassis like the Jeep JK and such. Several non-compliance ("49-State") examples are in the field now. 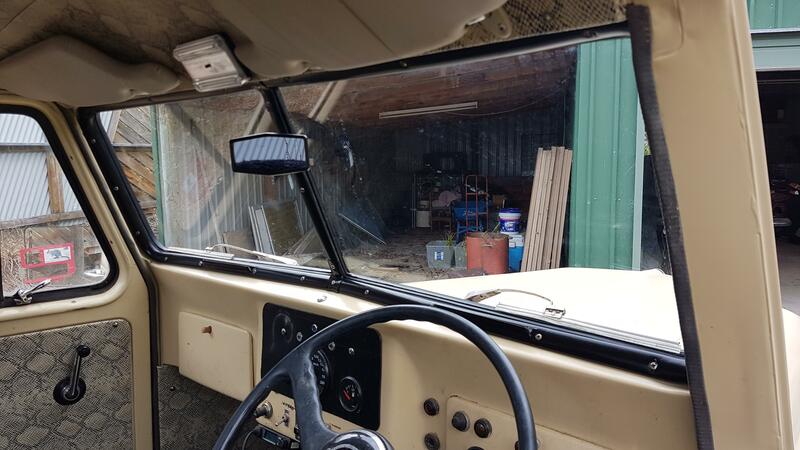 You'd like the installs on an FJ62 chassis, FJ40s, Land Rovers and a TJ Wrangler or two. Ian, this is fascinating! The derivative Jeep models and even full departures from U.S. models are really something. I like the Combat 6 (Falcon 144/170 powered!) and Nissan diesel engine options. Apparently, the Australian division was given autonomy to serve the country's usage needs. 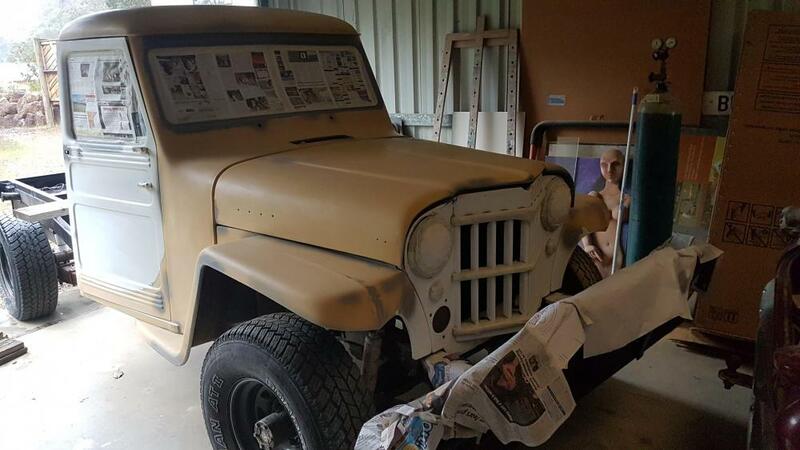 Your CJ10 (J10 'Tonner') and other models look stout and rugged in the marketing photos. 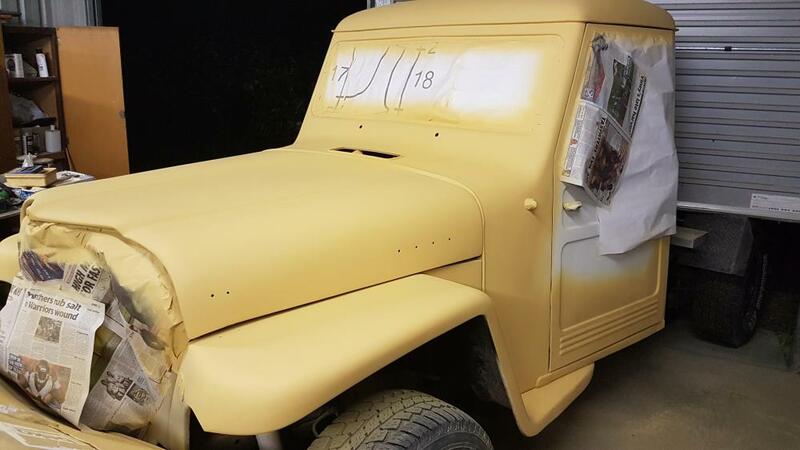 There's a bent on utility much like the U.S. vehicles in the day...I like the pragmatism in the design features and continued build of models that worked well—like the CJ-7. Thanks for sharing...Others should really find the information interesting. 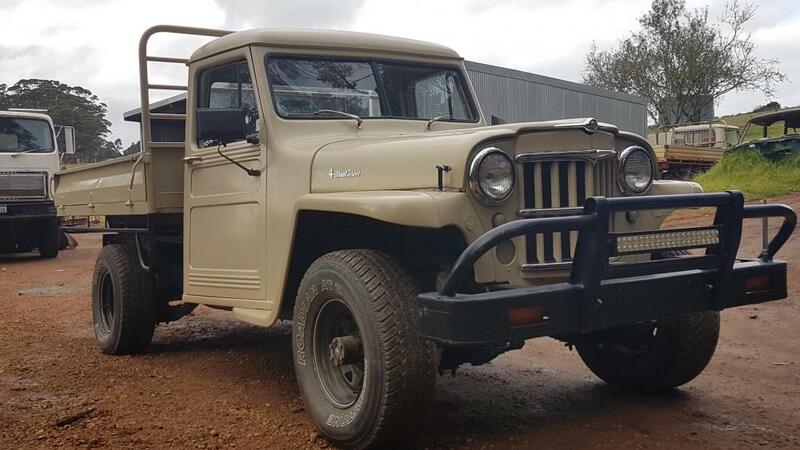 Jeep had an early presence in Australian. The tall hood CJ-3B happens to be my favorite flat-fender!